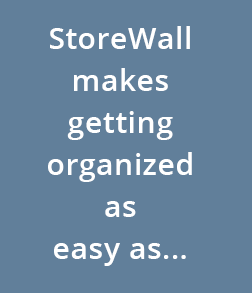 Expand and organize your space with wall-mounted storage solutions from StoreWALL. With superior materials and construction, our products are built to last. Plus you won’t find a system that’s easier to install. Available in multiple finishes, there’s a look for every space. Trust the things you value to StoreWALL, the best value in storage solutions. I found the StoreWALL very easy to place where I wanted it. It was a very simple process, I had my daughter hold it in place while I placed it on the wall. It only took me about 5 to 10 minutes to have it right where I wanted it. Men and women will love the way the StoreWALL looks and how easy it is to put together. I have found myself thinking about all the places that I want to place the StoreWALL. * Promo code must be entered on storewall.com to receive discount. Offer not valid on price adjustments, on prior purchase, taxes, shipping and/ or handling fees.Offer Non-transferable. Consumer Promotional Codes not applicable to Dealer orders. Free Shipping only to the Continental US is standard Ground service. Offer good now through —.